Most of the 84 million members of the Millennial Generation in the United States have far more politically tolerant attitudes on race, gender, and sexual orientation than their older counterparts. Yet despite growing political tolerance, inequality remains a persistent threat to our democracy. 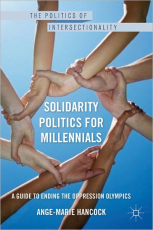 Solidarity Politics for Millennials argues that we face a twenty-first century Oppression Olympics: a political framework that encourages competition instead of solidarity among folks of all ages and backgrounds to turn us in the direction of liberty and justice for all. Instead of rehashing the same old problems, author Ange-Marie Hancock offers a solution -- solidarity -- and an approach -- intersectionality -- for change we can achieve.